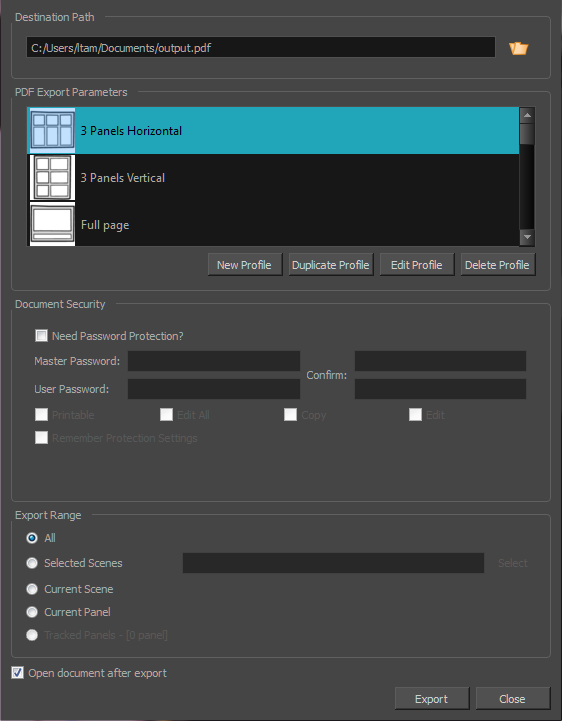 The Export to PDF window lets you export a storyboard project as a PDF file or share electronically. Lets you specify the name and location of the PDF file you are creating. This is a classic layout of a printed storyboard. It consists of three panels per page, including captions, in an horizontal arrangement. This is a classic layout of a printed storyboard. It consists of three panels per page, including captions, in a vertical arrangement. This layout consists of one large panel per page, including captions. This layout consists of a total of eight panels per page, organized on two rows of four, with captions in the middle. This layout consists of a total of 12 panels per page, organized in three rows of four. No caption is included. This layout consists of a total of five panels by page, aligned on the left side of the page. Captions and duration are aligned in two consecutive rows on the right side. Note that your PDF reader and system may require an additional font package in order to display the PDF file properly. This layout consists of a total of 5 panels per page, aligned on the left side of the page. Captions are organized on the right size of each panel. This export also includes a cut and a duration column, and displays the duration of each scene at the beginning of every new one. This layout consists of a total of 80 panels per page, organized in ten rows of four. No caption is included. This layout consists of a total of 5 panels per page, aligned on the left side of the page. This export includes vertical columns for the dialog, action, sluggin, notes, and time (duration) column which is displayed near the end of each scene (optionally). The scene name appears near the top of the first panel of a scene. The caption titles appear at the top and do not repeat at each panel. The total duration appears at the bottom of the page. Creates a completely new layout. Makes a copy of the selected layout from the list. Lets you edit the selected layout from the list. Deletes the selected layout from the list. Adds password protection to the PDF file. Lets you enter an administrator password. The owners of this password will not be bound by document security. The password must have a minimum of six characters. Lets you enter a user password. The owners of this password are bound to the protection options you define. The password must have a minimum of six characters. Lets you re-enter the master and user passwords to validate them. Gives the user permission to print the storyboard. Keeps your settings as the default. Opens the PDF file after export.